Steven Seefeldt speaks with humility about his new job assignment as the state horticultural specialist with oversight of the Georgeson Botanical Garden. He greatly respects his predecessor, horticulture Professor Pat Holloway, and her work with the botanical garden. Steven Seefeldt prepares to measure plant diversity in Delta. Maintaining the garden will be a challenge because it now has just one permanent employee, Katie DiCristina, who has to do everything at the garden, he said. The garden relies on many dedicated volunteers and a declining number of seasonal workers who plant and tend the gardens. He and DiCristina plan to meet with the Georgeson Botanical Society, garden donors and other interested people to talk about how garden operations can best continue. Seefeldt hopes Georgeson will continue to be a demonstration garden where people can see how things grow. “I’m excited to help it evolve,” he said. The assistant professor is already conducting horticultural research, including work on peonies. He is working with seven peony farms around the state to develop an integrated pest management plan for dealing with two peony pests, lygus bugs and thrips. Next year he is funded by a state Specialty Crop Grant to determine which pesticides and herbicides work best on insects and weeds that afflict peonies. During the past year, one farmer on the Kenai lost thousands of peony plants. Seefeldt thinks guidelines for different areas of the state need to be developed for growing peonies, including soil remediation, fertilizer and watering recommendations, plant spacing, etc. But those studies are only beginning. He also hopes to provide more support to new farmers, possibly by setting up an incubator farm in which prospective farmers could rent a quarter-acre of land or more to get experience farming. Seefeldt says Alaska has ag-quality land the size of Iowa, yet it lacks several key specialists, including plant breeders that could help develop varieties suitable to the state, plant physiologists and agricultural entomologists to name just a few. He hopes that by getting grants and additional funding, he can help build a team that includes some of this expertise. Seefeldt is by training a weeds specialist. He earned a doctorate in crop science from Washington State University in 1995, after completing research on understanding resistance to herbicides in wild oats. 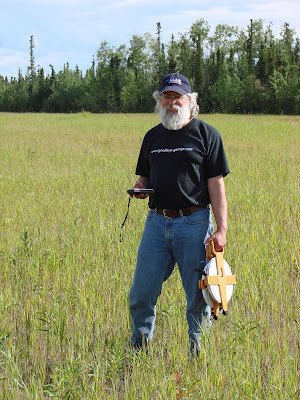 He worked as a research agronomist for 25 years for the Agricultural Research Service in Pullman, Washington; Dubois, Idaho; and in Fairbanks, until the federal government stopped funding ARS in Alaska. He became the agricultural and horticulture agent for the Tanana District Extension office in June 2012. He will continue some of that outreach work, handling phone and email consultations with gardeners and farmers. He will also continue to teach Master Gardener classes for now. He hopes that Master Gardeners will complete some of their required volunteer hours at the garden. Seefeldt’s varied professional life has also included two years of agricultural research in New Zealand. Before going back to school to earn graduate degrees, Seefeldt served as a Peace Corps forestry volunteer in Niger, as an environmental scientist in Mauritania (west Africa), and a teacher of math, science and French for the Nezperce School District in Idaho.